It was shortly after 6:30 this morning that Mollie began licking my hand. This is her way of letting us know she wants us awake and wants to go outside. Ignoring her doesn't do any good, we've tried. So, as hard as it was, we got up (ugh). John took her outside for her morning ritual and I made coffee. We both sat at our computers with our coffee for about an hour before we had breakfast enjoying the bright sun streaming through our windows. 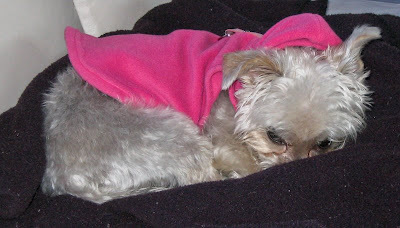 While John was working on photoshop, I worked on my knitting project with Mollie napping by my side. 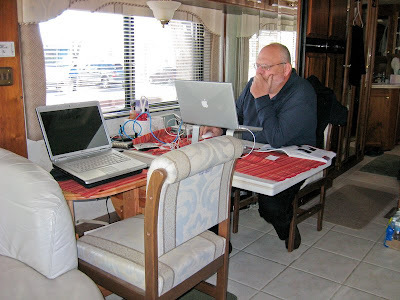 John has been brushing up on photoshop in preparation for his workshop that begins on Sunday. It was still very cold outside again this morning and neither one of us was anxious to spend much time out there until it warmed up. 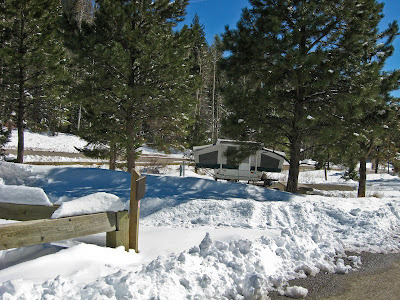 Hyde Memorial State Park and also see the popular Ski Santa Fe ski area. Ski Santa Fe is high in the mountains. Some of the runs start at over 12 thousand feet. It's amazing that it only 30 minutes from downtown Santa Fe. As the road twisted up the mountains we were treated to awesome views. The sun was shining brightly and there wasn't a cloud in the sky. The higher we went the snowier and colder it became. About half way up is the State Park. Only one of the campground loops appeared to be open and it even had a few campers in it! What hardy souls they must be! This would be a beautiful place to camp in the summer. 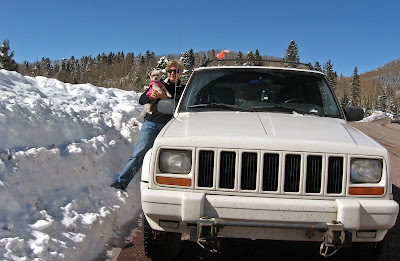 As we made our way up the mountain the snow levels got even deeper. 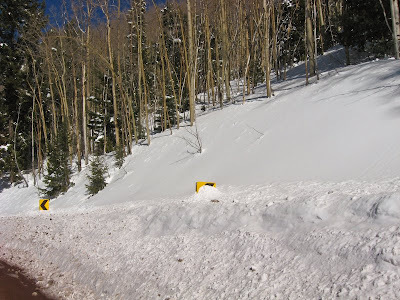 Some of the snow piles along the road were higher than our car and higher than the road signs. 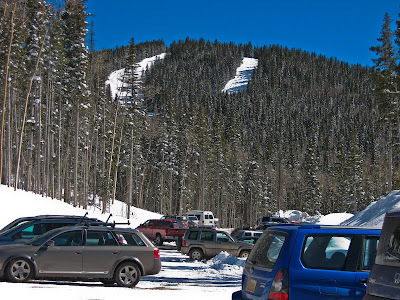 When we reached the ski area we were over 10,300 ft in elevation and 25 degrees.. Judging by the number of cars in the parking lot the ski resort was doing a very good business today.